I really like Grass-Fed Beef Collagen Powder by Zint. No bad taste, no grittiness, etc. Very pleased. 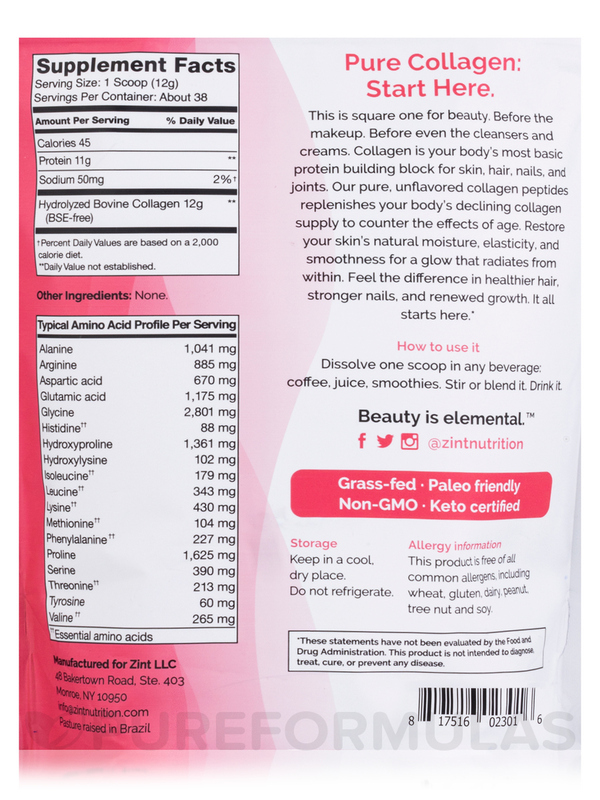 Grass-Fed Beef Collagen (Hydrolyzed Collagen Types I & III) by Zint dissolves well and fast. No clumping and no taste! I loved how easy this Grass-Fed Beef Collagen (Hydrolyzed Collagen Types I & III) by Zint dissolves with no taste at all. The human body is composed of 30% Collagen! It is found in our skin‚ hair‚ muscles‚ bones‚ teeth and tendons. It creates elasticity for your skin and literally helps hold the body together. 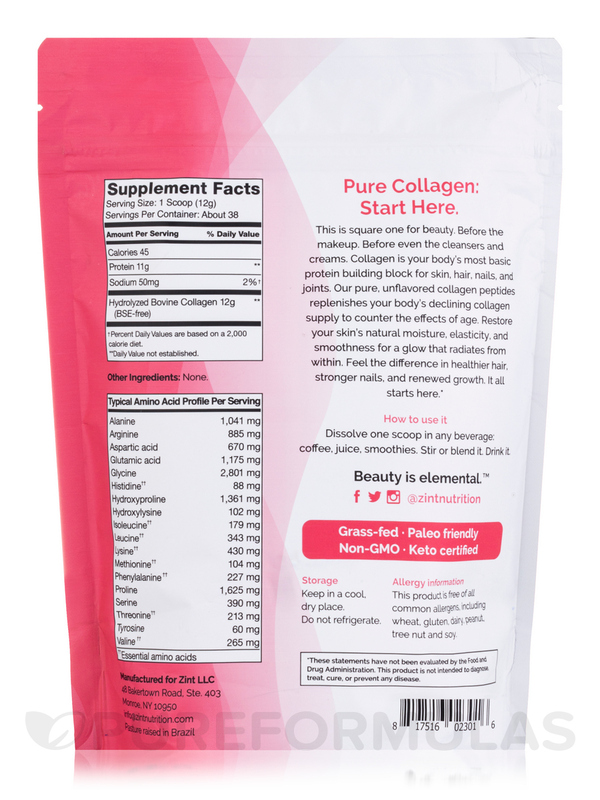 By our mid 20's‚ collagen product is already in decline. As we continue to age‚ our body's natural collagen production further decreases while stress and physical impact increases. The unfortunate result is an acceleration of age related markers such as wrinkles‚ sagging skin as well as the weakening of joints‚ bones‚ teeth and hair. 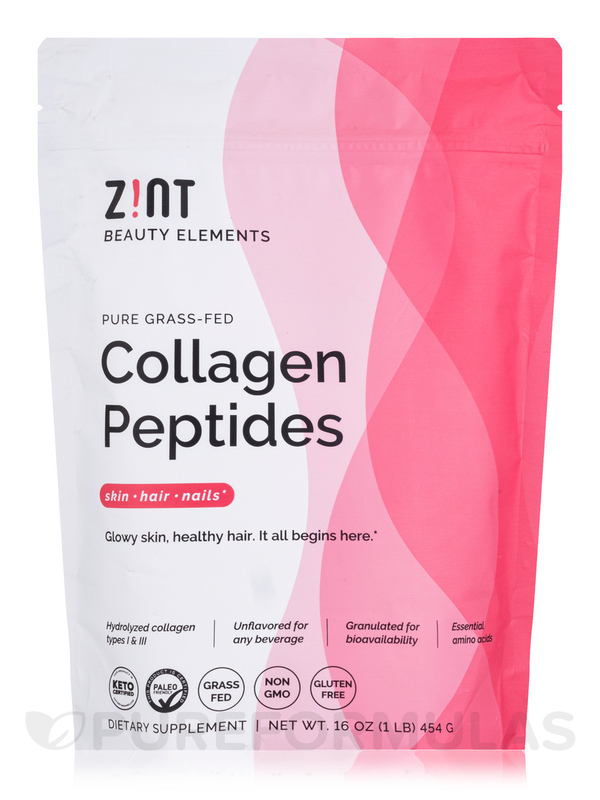 Zint Collagen Hydrolysate is a nutritional collagen peptide that helps support and invigorate healthy skin‚ hair‚ teeth‚ nails‚ joints‚ digestion and hormonal balance. In addition‚ Gelatin is abundant in the amino acid glycine‚ which helps support healthy liver function to further assist the body in reaching optimal health and well-being. Zint Collagen is free of all common allergens‚ including wheat‚ gluten‚ dairy‚ peanut‚ tree nut and soy. Non-GMO / Paleo-Friendly / Gluten-Free / Hormone-Free / Antibiotic-Free / Certified Kosher. Mix one scoop in coffee‚ smoothies‚ and your favorite recipes for an effortless way to supercharge your anti-aging supplement regimen (scoop included). Keep in a cool‚ dry place. My nails and skin have never looked better! I will not be without thisGrass-Fed Beef Collagen Powder by Zint! I add it to my morning smoothies. Dissolves easily in water or smoothie. I love Grass-Fed Beef Collagen Powder by Zint! I feel that the collagen really helped with my joint pain and the powder didn't have too much of a chalky consistency. I could taste it a little but I've tasted worse protein powders. I decided to try Grass-Fed Beef Collagen by Zint because it was on sale. Pretty much the same as what I usually buy in the green can. This form of collagen has helped my skin and my hair fill back in after being ill. It took a month or so of taking Grass-Fed Beef Collagen by Zint to see improvements, but I am now enjoying fuller hair where it was thinning on top of my head. My teeth feel stronger, I can crunch down on things like tortilla chips without feeling like my teeth are going to break off. My skin looks vibrant and lines are diminished. I will keep using this stuff. This Grass-Fed Beef Collagen (Hydrolyzed Collagen Type I & III) by Zint is my favorite protein powder. Dissolves completely in hot or cold items and has virtually no taste. I add it to smoothies, baked goods or even just my morning tea. My hair and nails grow like crazy since I started using this. Dissolves fast and at a great price!! We just started using Collagen Hydrolysate (Pure Protein) by Zint a few months ago.It’s so good in our morning smoothies. Being vegetarian it’s a good way to get the protein without actually eating meat.Ewe! This is a pure high quality collagen powder. Collagen Hydrolsate (Pure Protein) by Zint add to my tea every morning. Use for joint health. As a runner in 50's has kept my knees and other joints health, no clicking. Dissolves easily, no taste, easy to add to any drink.